Boxer vs GMail. What is the best Business Email software? Usually the companies that develop and sell intranet portals, position them as an alternative to the Email. They say that instead of endless mailing back and forth, your users can now work with data in one place. But with Google - it's another story. Google wants companies to use Google+ as a social intranet solution and continue using GMail. So that's why both solutions have been closely integrated. In GMail you now can filter messages by Google+ circles. So, if you create a Google+ circle for a workgroup, you can view all emails related to this workgroup separately. In the right column near the message you now can see the latest post of this contact in Google+. 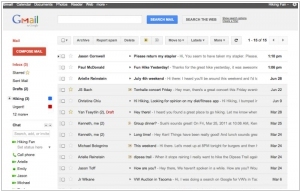 In addition, contacts in GMail will be updated, if your co-worker updates his profile in Google+. Thus, your address book will be always relevant. Finally, the attachment in GMail messages can now be shared to Google+ circle. For example, you received a contract from the client - and can quickly share it to discuss with department managers. Obviously, such integration will soon appear also in Google Docs, so that you could easily share files and documents to Google+ circles. For now the similar Google Docs sharing works via the Google Groups service.